The new Merkel government has to reduce the dependencies on exports by stimulating domestic growth forces in Germany and Europe. At the same time, Berlin should push for a more ambitious national and European innovation policy as well as a robust European foreign trade policy in Brussels. The piece was first published in Berlin Policy Journal, Bruegel and Merics. A short version was published in German in FAZ on April 4, 2018, in Fremde Federn. The German export-oriented economic model is facing a massive attack this year. Germany is caught between tough American protectionism and aggressive Chinese industrial policy. The US government threatens to impose painful sanctions on key German export goods such as automobiles. China’s industrial policy is aimed at acquiring important industrial technologies and, in the medium term, at replacing existing foreign technology leaders in the automotive, engineering and chemical industries. Because of the sizes of their markets, the United States and China undoubtedly have the tools to hurt Germany’s export-oriented economy. The new German government under Angela Merkel will have to buffer the effects of the US-Chinese squeeze. It should reduce the vulnerability of its export industry by promoting domestic growth and investment in Germany and in Europe. At the same time, Berlin should push for a more ambitious national and European innovation policy as well as a resilient European foreign trade policy. First, the German dependency on exports to the United States and China must be reduced. The focus should be on strengthening not just German but European growth forces. All euro area countries except France, Finland, Cyprus and Belgium have a current account surplus. The euro area as a whole has a surplus of around 3 percent of GDP. Germany’s surplus amounts to almost 8 percent of GDP. These external surpluses are no longer sustainable in a world in which the US president is threatening to launch a trade war and the World Trade Organization can no longer enforce the rules for open markets in key economies. Regardless of this acute pressure situation, it is also in Germany’s interest to liberate domestic growth forces. German business investment has been weakening for years. The level of German gross investment in the industrial sector has been below even that of France and Italy since the start of the millennium. A timely and feasible step would be to massively improve the rules for depreciating assets on capital, software, and research investments in the German tax code. This is all the more necessary as US corporate tax reform allows companies to immediately depreciate 100 percent of their expense for equipment and building upgrades. Beyond reforming the tax code and lowering other regulatory barriers, Germany will have to accelerate the development of public infrastructure. For example, it is important not only that the road and public transport industry gets improved but also that data infrastructure, broadband gets strengthened. Also funding for schools and universities could be improved. A strengthening of especially private but also public capital intensity will also help raise wage levels in Germany. After all, capital is complementing most labour activity and is not a substitute. This set of measures has the capacity to promote domestic growth and reduce dependence on exports. The resulting growth in Germany would also help EU partner countries such as Italy through increasing demand for their products. Second, German innovation policy must make a real leap forward, especially in the field of the digital economy, so as not to leave the future of technological change entirely to others. American and Chinese IT corporations are in the process of dividing up world markets, setting the technological standards that will be associated with huge licensing revenues in the future. They are also rushing into the meta-technology of the near future: artificial intelligence. At present, Germans and Europeans do not have a lot to offer to the digital economy. The Digital Single Market in the EU is not progressing. As early as 2019, Europeans will become painfully aware of the shortcomings in innovation policy in their telecommunications networks when, for example, the Chinese company Huawei begins to install 5G mobile technologies in Europe, the prerequisite for networked industrial production and autonomous driving. Europe needs a much more ambitious and active digital innovation policy that must include the targeted promotion of European “infant industries,” for example through the development of larger venture capital markets. Research shows that scaling of companies is more difficult in Europe than in the US due to lower access to risk capital in all industries. With regard to critical infrastructures, there should be no taboo on the targeted support of currently weakened European 5G developers such as Nokia or Ericsson. If European companies for semiconductors and mobile networks disappear from the markets, dependencies on US and Chinese technology providers will not only create security risks, but will permanently minimize European innovation capacities. European governments will therefore need to fundamentally rethink their innovation policies, and in particular their digital policies, in order to counter the rush of American and Chinese companies and innovations. The German coalition agreement does hint to the importance of research but the impression it gives that rather marginal changes are deliberated. Instead, a step-change is needed. Trusting in the power of company- and market-driven “innovation from below” will be necessary but insufficient. This is because digital transformation requires new, state-financed infrastructures, targeted support measures and educational offers, as well as continuously adapted market rules that are not provided by companies, but by governments and parliaments. Public innovation policy must simply become more ambitious and think in terms of bigger goals and dimensions. Substantially strengthening research and development spending in the European and German budgets is only a first necessary step in this direction. 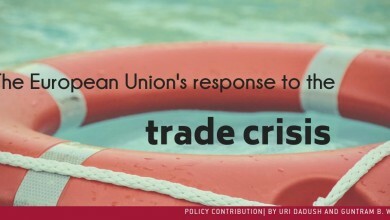 Third, Germany should campaign for a robust foreign trade policy in Europe. On the one hand, this is about adequately examining security interests in foreign investments and acquisitions, and flanking them with a pan-European coordination office. On the other hand, it is about protecting strategic technologies from takeovers through market manipulation practices. For this task, the competencies of the EU Directorate-General for Competition should be strengthened. It is completely unacceptable that foreign top dogs operating with special state funding from closed domestic markets, based on practices that massively distort competition, should be able to drive European companies out of the European market. Germany must stand up for open markets and fair trade practices more decisively than before through the EU’s Directorate-General for Trade, without weakening the European institutions through national unilateral action. European Trade Commissioner Malmström is doing a very good job not only in her negotiations with the United States and China, but also in establishing new strategic trade relations with, for example, the Latin American Mercosur or the free trade agreement with Japan. Europe should build further partnerships and, at the same time, sharpen its trade policy instruments in order to defend itself in case of conflict and to represent European interests more effectively than before. Germany can no longer avoid an economic policy correction in face of the dual pressure from the United States and China. The new German government has to act now if it wants to defend domestic industries from unfair competition while releasing Europe’s own growth forces. Sebastian Heilmann is the president of the Mercator Institute for China Studies (MERICS). Guntram B. Wolff is the director of BRUEGEL, the think tank focusing on economics in Brussels.